Tick is an easy to use and low cost Toggl alternative. If you're looking for time tracking software for your company, Tick and Toggl are two great options to consider. Both products launched in the mid-2000s to help teams track their time, but they have different views on how and why your team needs to track their time. Toggl's focus is on helping individuals and freelances capture their time without many constraints. You don't have to setup projects, tasks, or tags. You just hit a timer and start tracking. For Toggl it's all about lowering the barrier to entry. For Tick, time tracking is the key to a more profitable business. Tick's has always focused on helping teams identify where they are spending their time, so they can run more profitable projects. Everything is focused on helping your team hit your budgets. You get budget updates whenever you log a time entry and reports that tell you which projects are the most profitable. Toggl is great for teams of 5 or less that don't need tons of features; they have a generous free plan to get you started. Though once you need to add a 6th person to your team that same plan will cost you $60/month. If you need any of the advanced reporting or profitability features you're looking at plans can reach $59/user/month! 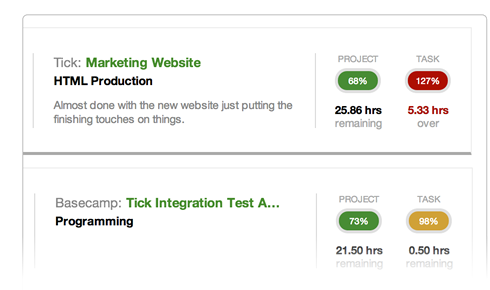 Tick's pricing is based on the number of active projects your team runs. If you're just tracking time towards a single project then it's completely free—even if you have 60 people on your team. Every Tick plan comes with unlimited users, so you don't have to start paying more just because your team is growing. "We made the move to Tick because Toggl didn't provide an easy way to track the progress of a project or task. With Tick, we're able to see this." Teams of 5 or less. Use Toggl's basic features for free!